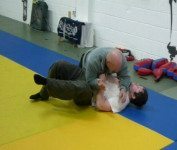 Andy Seatherton has been practicing martial arts since 1972, when he began learning Judo in Exeter, Devon in the South West of England. Andy has been teaching Systema since 2012 having attended many Seminars with some of the world’s top Systema masters over the years, including Vladimir Vasiliev and Martin Wheeler. Andy is passionate about martial arts that are effective and practical, having previously studied Judo, Aikido, American Kenpo, Ju-Jitsu, Tang-so-do, European Boxing and Escrima.